Applying the concepts developed thus far, some of the actions of various antiseizure therapies can now be examined (54,55) (Fig. 9). Clinical indications, pharmacokinetics, doses, and side effects are not discussed here; the reader is referred to standard textbooks for this information. Several AEDs target aspects of the inhibitory system. Phenobarbital (PHB) and benzodiazepines (BZDs) bind to different sites on the GABAa receptor. 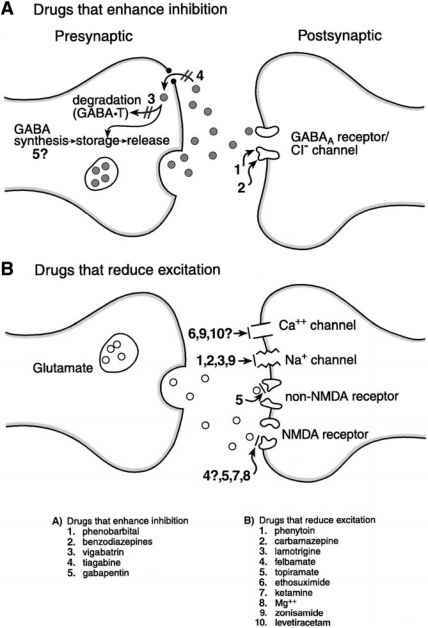 Both drugs enhance inhibition by allowing increased Cl- influx through the GABA receptor: PHB by increasing the duration of chloride channel openings and BZD by increasing the frequency of openings. Vigabatrin (VGB) is a new AED that is not yet available in the United States; it has shown much promise in other countries for the treatment of infantile spasms (especially in children with tuberous sclerosis) and other seizure types. VGB is an example of a "designer drug," created to target a specific pathophysiological mechanism: VGB inhibits the enzyme that degrades GABA (GABA transaminase), thereby increasing the amount of GABA available to partake in inhibitory neurotransmission. Another new AED, tiagabine (TGB), also increases GABA availability but by a different mechanism: preventing GABA reuptake into the presynaptic terminal. The mechanism of action of gabapentin (GBP), despite the presence of GABA in its name, is still unresolved; GBP may increase the rate of GABA synthesis or release. Other AEDs affect aspects of neuronal excitation. Phenytoin and carbamazepine, and the newer AEDs lamotrigine and zonisamide, block voltage-dependent sodium channels and reduce the ability of neurons to fire repetitively. Ethosuximide, used primarily for absence seizures, blocks a unique calcium current ("T-current") present only in thal-amic neurons, preventing them from firing in an oscillatory fashion and recruiting neo-cortical neurons into spike-wave patterns. Several of the new AEDs are believed to alter the function of NMDA receptors (lamotrigine and felbamate) or non-NMDA receptors (topiramate). The dissociative anesthetic ketamine blocks the ion pore of NMDA receptors; however, ketamine and similarly acting agents have been disappointing in clinical trials because they cause excessive sedation or behavioral activation. Much effort is being expended to design novel AEDs that selectively target other aspects of the NMDA system (Fig. 2, inset). 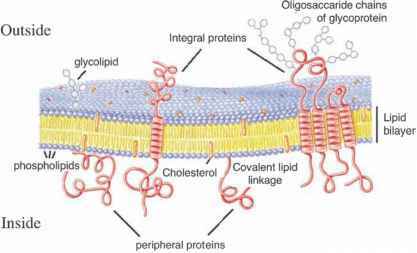 In addition to blockage of the ion pore, antiseizure activity may be produced by antagonists of glutamate binding or blockade at other sites on the receptor complex that must be activated for the receptor complex to function (such as the glycine coagonist site). The voltage-dependent block of the NMDA receptor ion pore by Mg2+ may be another site for novel anticonvulsant action; in fact, magnesium sulfate has been used for years by obstetricians to control seizures in eclampsia. Topiramate, felbamate, and gabapentin, as well as the established AED valproic acid, probably have mixed excitatory and inhibitory actions. The mechanism of action of levetiracetam has not yet been clarified, but it appears to be "novel," unlike any of the other AEDs; it may block the N-subtype of calcium channels. drate, and low-protein diet), remain largely unknown. ACTH may act in an age-specific manner to decrease the action of its excitatory precursor (corticotrophin-releasing hormone, CRH) on seizure-sensitive regions of the developing brain (22). The search for mechanisms of action of the KD comprises a large portion of this volume. One could envision that the KD might alter brain energy metabolism, excitatory neurotransmission, inhibitory neurotransmission, individual ionic conductances, or several of these targets (56,57). The evidence that the KD effectiveness often persists even after the diet is discontinued suggests the possibility that the KD could exert an antiepileptogenic benefit as well (see Chapter 22). Animal models can be used to design experiments to test each of these hypotheses. New AEDs in the coming years are likely to increase our ability to treat seizures selectively according to specific pathophysiologic mechanisms. But to use such agents most effectively, a grasp of the underlying principles of normal and abnormal neuronal function is essential.